Barcelona: Lewis Hamilton roared back to form and secured a stunning pole position for Sunday's Spanish Grand Prix when he delivered a record-breaking qualifying lap on Saturday. 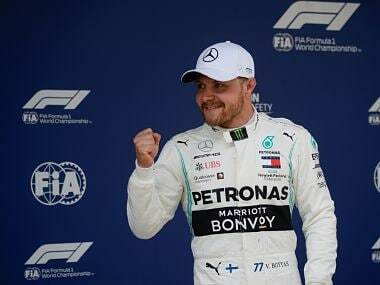 The defending four-time world champion and current series leader broke the track lap record with a series of laps that culminated in him clocking 1:16.173, 0.040 seconds ahead of his teammate Finn Valtteri Bottas as Mercedes locked up the front row of the grid. 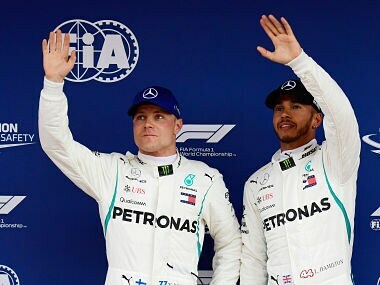 It was Hamilton's second pole this season, after the season-opening race in Australia, his third straight in Spain and the 74th of his career. It broke Sebastian Vettel's streak after three straight poles. German four-time champion Vettel was third fastest for Ferrari ahead of his teammate 2007 champion Finn Kimi Raikkonen and the Red Bulls of Dutchman Max Verstappen and Australian Daniel Ricciardo. Dane Kevin Magnussen of Haas was seventh ahead of two-time champion and home hero Fernando Alonso of McLaren, fellow-Spaniard Carlos Sainz of Renault and Frenchman Romain Grosjean of Haas. The top four were separated by only 0.132 seconds at the end of the session – which promises a close race on Sunday at the Circuit de Catalunya. 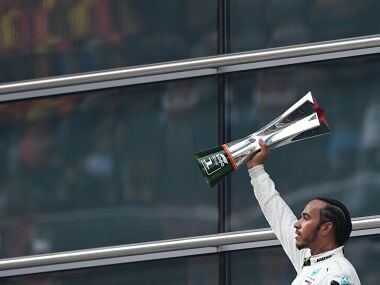 "I needed this pole – I've not had one for a while," said Hamilton who leads Vettel in the drivers' title race by just four points after four races. "And it's a Mercedes one-two which is great here. There is always a great atmosphere here with loads of British fans and even Spanish fans supporting us, which is great too!" Bottas said: "It was close like it has been all week. I ruined my first run in Q3 so I really only had one chance. It is a shame it is only four-hundredths, but it is good for the team. Now we want to get the one-two we deserved in Baku…"
Vettel said he was happy with his lap. "I was feeling good too and I looked at the tower and then I saw my name didn't go up – but, then, we expected Mercedes to be strong. "Let's see what happens now tomorrow. I hope everyone will enjoy it!" The Q1 session began in mild conditions with rain threatening and soon produced drama. 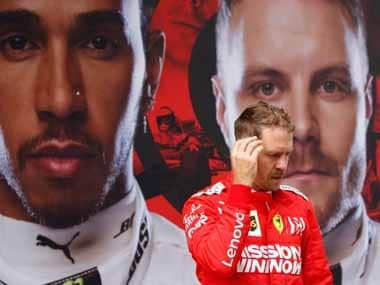 After being accused of "sandbagging" by Hamilton, Ferrari quickly showed they had more pace than expected by rising to the top of the times with Vettel outpacing Raikkonen. New Zealander Brendon Hartley of Toro Rosso was not among the runners following his huge accident at the end of final practice, which left the rear end of his car wrecked after spinning into the barriers at high speed. He will have to ask the race stewards for permission to take part in Sunday's race even if his car is repaired and he can prove his fitness. He was classified 20th and was eliminated along with German Nico Hulkenberg, who suffered fuel problems with his Renault, Swede Marcus Ericsson of Sauber and Russian rookie Sergey Sirotkin and his Williams team-mate Canadian teenager Lance Stroll. The second qualifying session began with the top four delivering record-breaking laps as both Mercedes and Ferrari scorched around the circuit, Vettel topping them off with a 1:16.8 to go quickest. Hamilton tested a set of super-softs before the session ended with Belgian Stoffel Vandoorne of McLaren, Frenchman Pierre Gasly of Toro Rosso, the Force India pairing of Frenchman Esteban Ocon and Mexican Sergio Perez, and Frenchman Charles Leclerc of Sauber eliminated from the final round. The top ten all went out on super-softs at the start of Q3 with Hamilton smashing the records again in 1:16.491 to run three-tenths clear of nearest rival Verstappen as Red Bull mounted a stunning fightback. 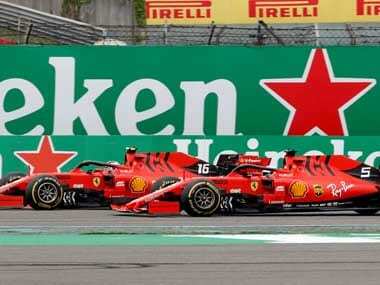 Ferrari, unexpectedly, were pushed back to fifth and seventh, 0.7 and 1.7 seconds adrift respectively with Ricciardo third for Red Bull before the final runs when Hamilton delivered his stunner.